﻿ 4 Email Marketing Goals to Set in the New Year (And How to Make Sure You Actually Achieve Them) » Red Mango Marketing! No matter what time of year it is, it’s always a good idea to set marketing goals. Setting goals makes it easier to measure the results of your different marketing activities, including your email marketing campaigns, and also provides the focus and motivation you need to stick with them. For example, with the New Year just beginning, our team is in the process of looking at the performance of our Hints & Tips email newsletter to see what worked well, and how we can improve in the year ahead. Our ultimate goal will be to continue to deliver actionable content that our small business and nonprofit audience can use to do more business and achieve success. We’ll be taking a close look at key metrics like opens, clicks, and list growth to see which topics have attracted the most interest and engagement. As you prepare for the year ahead, take some time to think about the goals you’d like to achieve. Your email list is one of your most valuable marketing resources. These are people who opt-in to receive updates from your business. Many will be existing customers who have shopped at your store or done business with you in the past. Other people may be completely new to your business and signed up to learn more about you, your business, and how you can help them address a specific need or problem. Hopefully, you’ve already had some success with growing your email list. But if you want your list to have an even bigger impact in the New Year, there are a few things you’ll want to consider. Am I making it easy for people to sign up? Growing an effective email list starts with making it easy for people to sign up in all the places they’re interacting with you. You can collect email addresses in-person — using a sign-up sheet or mobile device — and also add new contacts online — by adding a sign-up form to your website and Facebook Page. Am I giving people a compelling reason to sign up? Make sure your audience understands the value of signing up right from the start. What can they expect to receive? How often will they hear from you? What have other people enjoyed about receiving your emails? You can customize your sign-up form to demonstrate the value of joining your list, and look for opportunities to reward fans with an extra bonus right from the start. Your open rate is one of the best metrics for measuring the effectiveness of your email marketing efforts. Open rates let you know how many of the people who receive your emails are actually taking the next step to open and read the content you send out. The more people you get to open your emails, the more opportunities you’ll have to drive business results. Average open rates vary from industry to industry. If you’re not sure how your open rate compares to other businesses, check out our Comparison By Industry Chart. Are people looking forward to my emails? If you want to build an audience of people who actually look forward to your emails, you need to get permission before adding new contacts to your list. Once people sign up, it’s your responsibility to provide value in every email you send out. To put it simply — focus on sending emails that your audience will thank you for. Are my emails standing out in the inbox? Standing out in a crowded inbox starts with making sure people recognize that your emails are coming from you. Use a consistent from name and from email address in every message you send out. You also want to make sure people know what they can expect from your email when it lands in their inbox. Craft a compelling subject line that catches your reader’s attention and lets them know why they should click to open. Hopefully you’ve taken steps to get more people to open your emails, but how can you tell if people are engaging with the content you send out? One of the best ways to measure engagement is to look at your click-through rates. Click-through rates show you how many subscribers are engaging with your content and taking a desired action by clicking on links within your email. Getting more people to engage with your emails could mean more traffic to your website or blog, more registrants for your next event, or a greater number of people acting on an offer you send out. Am I making it easy for people to engage with my emails? Design can play a major role in whether or not people will interact with the emails you send out. This is especially important for readers on mobile devices who will be less likely to engage with emails that are difficult to read on a smaller screen. Keep your message as focused as possible, with one clear call to action that you want them to take. Constant Contact makes it easy to design emails that drive action with our customizable email templates. Am I providing a compelling reason to act? If people aren’t engaging with your emails, it may be because they aren’t connecting with the content you send out. Take some time to look through your click reports to see which links are getting the most attention. This is a great way to see what your readers are most interested in. You can also create separate email lists for people who click on a particular link and follow up with a more targeted email. At the end of the day, the success of your email marketing won’t be measured solely by opens and clicks; it will be determined by the impact your efforts have on your business. Whether that impact comes in the form of more sales, new clients, or increased foot traffic — you should take steps to measure your results beyond the inbox. Am I setting the right goals for my emails? Think about the goal of your email before you sit down to create it. In some cases, the goal will be a direct response — to drive sales, generate reservations, or bring more people into your store or office. In other cases, the goal will be focused on the long-term — to generate awareness, improve loyalty, or increase referrals. With a goal in mind, you’ll be able to make smarter decisions about the content you decide to include. Do I have an easy way to measure my results? You’ll also want to think about how you’ll measure the results of your campaign beyond the inbox. For example, if you’re including a coupon in your email to generate sales, you’ll want to make sure you can track how many coupons have been redeemed. You also want to pay attention to how many of the people who redeemed the offer are existing customers, and which are new to your business. With a tool like Trackable Coupons, you can monitor all of this in a single location online. You can also look to integrate the tools you’re already using to run your business with your Constant Contact account. Hopefully you’ve already seen the impact of an effective email marketing strategy. As we start off the New Year, look for small things you can improve on in the days, weeks, and months ahead. Trying a new list-growth tool could mean more customers coming through your door. Or, making tweaks to improve opens and clicks could mean more exposure for your business and more opportunities to turn readers into paying customers. Let us know what goals you have in mind for the New Year. And don’t forget — we’re here to help! 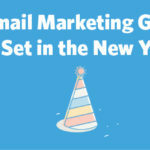 The post 4 Email Marketing Goals to Set in the New Year (And How to Make Sure You Actually Achieve Them) appeared first on Constant Contact Blogs. This entry was posted on Thursday, January 3rd, 2019 at 8:00 am	and is filed under Email Marketing, Featured, List Growth, News & Updates, Permission-based Marketing. You can follow any responses to this entry through the RSS 2.0 feed. Both comments and pings are currently closed.